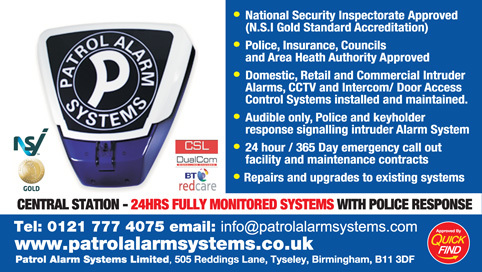 Patrol Alarm Systems are a Quick Find Directories approved and vetted local business providing intruder alarm systems, access control systems and remote monitoring systems across Solihull, Olton, Sheldon, Monkspath, Shirley, Knowle, Hockley Heath, Acocks Green and surrounding areas. "We have always found Patrol Alarms Systems to be a very professional company, their quotations accurately reflect the requirement, prices are competitive on a like for like basis, know well their industry and give excellent service. The equipment used is very reliable, they provide a good equipment maintenance service along with a speedy engineer call out when required"
"Patrol Alarms Ltd offer an excellent service, competitive pricing and outstanding customer support"
"Having been a customer of Patrol Alarms for over 34 years knowing that during that time we have received 100% support and commitment from them. It is reassuring in these times of large companues to know you are talking to a family business and not a switchboard! Oh I forgot to add that not only do they provide security for our home but also for our Business!! I think that says it all – don’t you?"